Start training SMARTER and overhaul your calf strategy. We all know the calf muscles are insanely stubborn and a pain to grow, which is why most people stop focusing on them altogether. It’s a valuable investment with an extremely high return to focus on training them regardless if the end result seeming to be a long journey away, and one that’s capable of completely transforming your lower body without doing much work whatsoever. Devote 10 minutes of dedicated, progressive calf work onto the end of a long day and you’ll quickly start noticing lumps on the backside of your lower legs. Make sure you do this on a regular basis and you’ll gradually build mountainous calves. Seated Calf Raises are THE best exercise to hammer the soleus directly. Load a plate machine. Sit upright with a tight core. Powerfully contract your calves and press up as far as possible. Hold for 1 second and lower slowly all the way down to the bottom. You should feel a deep stretch through your calves. Hold for 1 second at the bottom and repeat the movement. 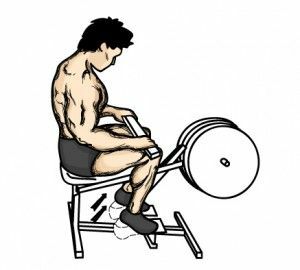 Alternatives: If you don’t have a plate-loaded calf machine, you can easily replicate the movement by placing two dumbbells on top of your quads (the front half). The Standing Barbell Calf Raise is an all-around calf killer that not only hits the gastrocnemius, but also works the core and cranks up the intensity. Load a barbell and place 2 plates together on the floor. Stand with your feet slightly more narrow than shoulder-width, with the balls of your feet on top of the plates. The plates help increase range of motion. Hold for 1 second at the top and slowly return all the way down to the ground. 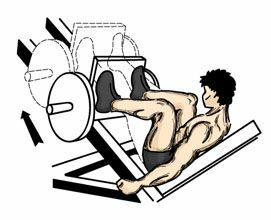 Alternatives: You can also do these with dumbbells, a Smith machine, or a standing squat machine. Or use your bodyweight and do them with one leg. Load up a leg press machine and keep your legs straight. Place the balls of your feet on the platform with your heels hanging off. Powerfully contract your calves and press the platform up as far as possible. Hold for 1 second and release back as far as possible. Hold for 1 second at the bottom and repeat. Posted on 4th June 2015 by Christina Helen Brown. This entry was posted in Fat burner and tagged 45 degree, build massive calves, calf exercises, calf raises, exercises to build, gastrocnemius, ripped calves, seated spinal twist, soleus, standing barbell. Bookmark the permalink.